How can I not be. It's September 11th again, and it's a Tuesday, and while its not severe clear, it is a clear bright day, cool and fall like just like it was 11 years ago. Part of me doesn't want all the hoopla. Part of me wants a quiet, simple observance. It's still too new, too raw to forget—I don't want all the heavy reminders. Then again, I realizes, its not for me, or about me or what I want. The accident is a blow to my ego as well as to my body and purse. I sort of prided myself on being a good driver (it's been decades since I last had a minor fender bender)--and I have never had a moving violation—ever. (I still don't—no one was cited.) I know, I know, they are called accidents because they aren't planned..and they can happen to anyone. But it's a first for me. Since the car was 10 years old, I had liability insurance, but not collision--so I am out of a car. The Lost at the DMV socks spent the weekend in the car, so they didn't see any progress. What was worse and more worrisome, was I had the peacock wedding shawl in the car, too. Both pieces of knitting were just were I left them (Weird stuff was missing from the car.. The food I was taking to the family reunion (hot dog rolls, relish, potato (sweet potato) chips and 3 bottles of soda—gone. And the sunscreen (The fold up kind use when you park in sun). But I had an (expensive) 40 foot extension cord in the trunk—and that was left there. Of course the body shop claims it was the police who took the stuff--not likely in my estimation. I suppose it could have been kids, (the window was left open, and the kids could have just rooted round when no one was looking—chips and soda are the start of party. The emotional upset as a result of the accident required some simple mindless knitting. I cast on Wingspan. It was already in my queue, and everything was handy—I had the pattern printed, and the yarn and needles already packed in a project bag, ready to go. I have already completed 5 wedges—the next wedge/wedge and half will be another purple one, and then another wedge and half of green. Together there will be another 3 wedges. Which will finish up the scarf, and the most of the skein. It will also create a bit of color symmetry. Not perfect symmetry--but a balanced look, all the same. A bit of purple will be left for the banding—which will be the perfect finishing touch. It should work out quite nicely. The yarn is Paton's Lace—mostly acrylic, with just a bit of wool and mohair to make it nicer. The color way is Sachet—I am not sure it actually matches anything I own—but I don't care. I like it. In spite of the simple mindless nature of the scarf—I've made major mistakes and have frogged back to the beginning of wedge twice. Still its been a perfect, simple project. Busy enough to keep me engaged, and to help still the emtional turmoil that the accident created. There is still more car/accident work to do—getting to the DMV and turning in the plates, and getting more paperwork done. I still don't have an accident report. (and won't till tomorrow). There were 2 fast moving destructive storms on Saturday (and NYC had two tornado's touch down) that made for some flooding (and accidents) plus the US open, and a Mets game.. Sources of more minor accidents.. My accident was between the storms—while the sun was shining—and the storms were not a factor. I'm glad to read you are no worse for the wear than an injured pride and a totaled vehicle. I did a wingspan and added 2 more wedges to it as I didn't think it was big enough. I like your idea of balancing out the color changes. 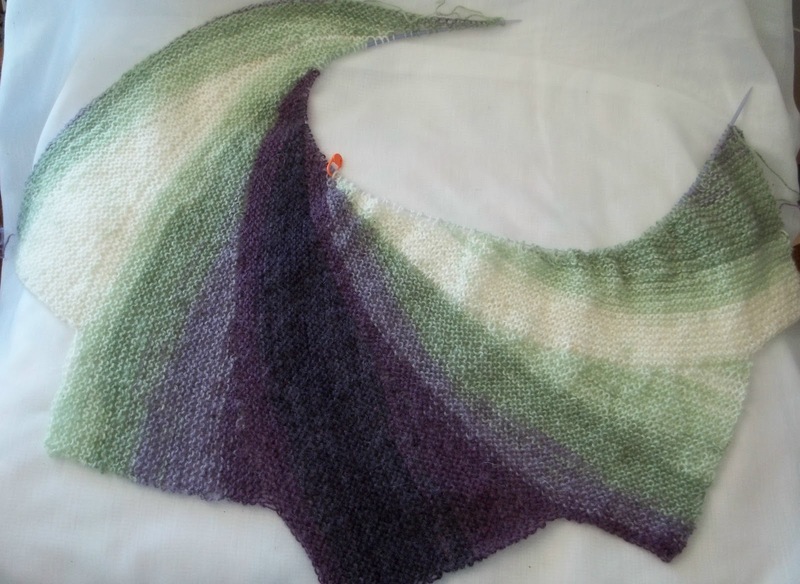 When I knit another one I will have to find some variegated yarn and try it. Sorry to read about the car mishap, but glad you are OK. And the socks and wedding shawl. Great colors on the Wingspan, looking forward to seeing the finished product. Oh Helen. I'm sorry about the day turned upside down and inside out and worse. The new shawl is so pretty that you've convinced me to make one, too. I reread your poem. Yesterday while I watched a movie called London River, about the bombings in London, I realized that it was September 11th. That day leaves me speechless. so sorry to hear about your car but relieved that you can claim your injuries are minor. I hope you feel calm and healed soon.